The SIMS High Speed Tapehead is available in 2 inch and 3 inch models. The Tapehead was originally developed to keep up with the growing needs of Washington State's fruit packing business. 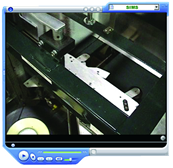 As throughput on packing lines steadily increased, the need for faster case sealers became a prominent concern. SIMS went about developing a faster and more reliable tapehead. Utilizing fewer moving parts, and therefore fewer wear parts, the patented SIMS tapehead is a simple and highly efficient design. The resulting tapehead is fast and reliable. SIMS tapeheads are currently running at continuous speeds of 188 ft. per minute through multiple shifts in 24 hour facilities 7 days a week.